I have enjoyed my regular black ink Vicuna pen, and raved about my Vicuna Multi Pen, so I wanted to give the new colored ink Vicuna pens a try. I went with the Sky Blue ink, and I am wishing I would have tried a different one first. The issue was noticeable almost as soon as I started writing. At least once or twice a line a glob of ink would hit the page, usually at the start or stop of a letter. You can see the dark spots in the written review above very easily. The black inks I have reviewed before don’t have this problem, either because 1. They really don’t have this problem, or 2. The base ink color is dark enough so it is not noticeable. Unfortunately, the light shade of Sky Blue ink doesn’t hide the dark spots. I was hoping it was a breaking in issue, but it didn’t improve over time. Maybe it is just this particular pen, so I would like to try another one, as well as some of the other colors like purple and orange. 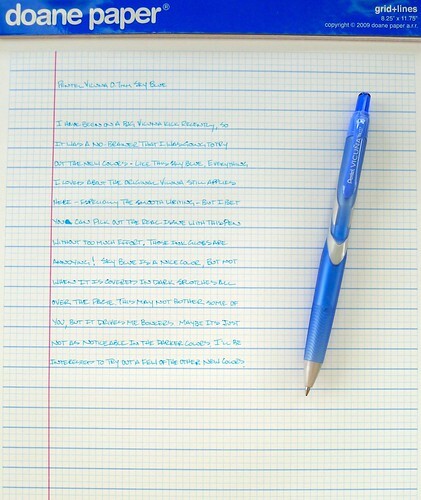 The Pentel Vicuna is a great pen, but you might want to rethink the Sky Blue. Posted on August 17, 2011 by Brad Dowdy and filed under Pen Reviews, Pentel, Vicuna.